Visit a bee farm, and follow the bees, as they carry “kisses” from flower to flower, and return to their hives with their tummies full of nectar. 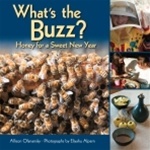 Learn how the honey is extracted from the combs and makes its way from the hive to the table, to be enjoyed with slices of apples for a Rosh Hashanah treat. From the same team that created Harvest of Light and Sukkot Treasure Hunt!